I recently moved to the wilds of western DuPage county. While I was on board for the respite of a quieter pace of life, lack of access to culture and good food was a major concern. The place gets plenty of love from the local crowd, there's always a wait. I love the design of the place, which is definitely diminutive (further attributing to the wait times), but has a bright, open, and modern feel that never feels claustrophobic. Although I've read complaints about the music, to my ears, their razor sharp curation of musicá latina contemporánea transports me to hipster cantinas in the DF. A nice foil to the oftentimes ladies-who-lunch vibe for this city kid. I've met very few margaritas that I love outside of my own kitchen, actually perhaps only the Bayless rendition (which is the blueprint for mine). Bien Trucha nails it, not syrupy sweet, built on quality tequila blanco, and complexly citrusy. They take all of about 5 minutes to inhale. Beyond the margarita, I appreciate their carefully selected beer list and specials. And the food. I judge any Mexican joint worth its salt, whether HitW mom and pop or jazzed up Nuevo based on their salsas. Perhaps since the place is Mexican owned (an important note), the heat in the salsas is not turned down. The habanero might be my favorite salsa in town: creamy, a bit smoky, and b@lls-deep hot. Across the board, flavors are huge– tacos are layered with contrasting ingredients like luscious and spicy chunks of pork belly, bright garnishes, & cheffy stuff like aiolis. What I just cannot live without is their seafood preps– we always start with the decadent cazuelita de camarón, briny shrimp popping out in a bath of luxurious queso, gilded with a tart, herbaceous cilantro chimichurri. Their beer battered pescado taco (a prep that is actually never actually something I seek out, despite its popularity around here and elsewhere) is archetypal– brittle-crisp, piled with red cabbage and adorned with a punchy aioli. Finally, to quote Drake "Hold up, hold my phone! ", the absolute best item on this menu is my favorite fish taco I've ever eaten. Kevin Pang agrees. I guess I prefer the crunch on the outside of my taco. The filling achieves an impossible creaminess that is augmented by a studding of avocado chunks. This taco does it all when anointed with the habanero salsa. My longtime- resident friends in the area rely on this place, its indispensable to them for festive, delicious nights out on the town. The whole package of the drinks, the space, and the simple, yet elevated approach to Modern Mexican, is one of a kind in this area. Suburban life a'int so bad, in fact with spots like Bien Trucha, I'm starting to not even miss the city so much. Bien Trucha has quite a bit of board play, much of it dating back three to five years. There have been recent glimmers of enthusiasm, including the tacos pescadillas on my top bites of 2014 list. Knitgirl's best things she's eaten lately: "Everything I had at Bien Trucha for lunch on Wednesday: fried fish tacos, the cazuelita de queso with shrimp and chimichurri, and the esquites. The limonada was awesome as well." jimswside knows what's up: "Bien Trucha was off the hook"; "I am in Geneva almost weekly and am pissed I had kind of avoided Bien Trucha, went Saturday and had a great, short visit that has me looking forward to a return for dinner and more lunches. 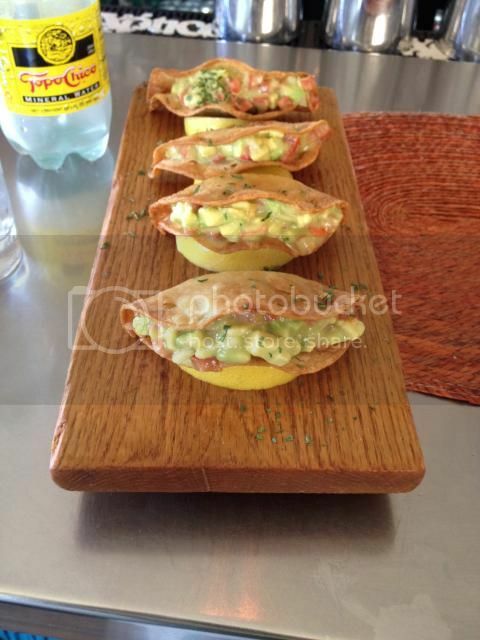 "; "Great lunch, food was fantastic, service to match." Da Beef pointed my way: "My reason for going out to Geneva somewhat often is Bien Trucha which is onr of my favorite restaurants in all of Chicagoland." "Bien Trucha is one of my favorites for "fancy Mexican" and part of that is because they don't get too fancy." Fellow Western-suburbanite, dicksond approves "I like the food at Buen Trucha - it is interesting, well executed and just plain tasty. I have been a couple of times and will continue to go back." Even old Kenny Z was a fan back in the day: "Then I started eating some of the freshest, most delicious Mexican food - classic and traditional or not - that I've had in Chicagoland." Please consider Bien Trucha for GNR class of 2015! I say with heavy confidence that I've surveyed more Mexican restaurants in the Chicagoland area than every publication put together combined. Bien Trucha is one of the best and you can quote me on that...which you did. The pescadilla tacos are some of the best fish tacos anywhere and their flautas the best I've ever had. I love the drinks and always ask for (and given) a second round of the complimentary black bean dip. Big fan. I've been a big fan of Bien Trucha since they opened. Food has always been excellent. Absolutely agree with this nomination. Stopped by yesterday while exiled to Naperville for dog sitting duties. What a gem! We both really enjoyed our lunch--guacamole, mushroom cazuela, pork belly tacos, corn and an unusual but delicious dessert of a cornmeal muffin with a tequila caramel sauce. Service was excellent. I strongly support this nomination. Wish it wasn't so far from the northern burbs. I'm really glad this was nominated, thanks Jefe!, otherwise I'm not sure I would have made the trip out there. I'll be looking for plenty of excuses to make the trek now that I know what awaits on the other side. Everything we ate was excellent, and clearly prepared with a lot of skill. The place couldn't be more my kind of neighborhood restaurant. It had a cozy yet hip bar vibe with an almost incongruous level of service, a type of service I don’t typically see in a similar bar/restaurant in the city. Food-wise, the salsas were amazing enough that little else was needed to wow me, yet almost everything that came out of the kitchen did, including the thinly (machine?) pressed house-made tortillas. I really look forward to a return visit, and Bien Trucha is definitely a GNR in my book. Love the deep fried fish tacos here, other items are fresh and very good as well(guac, salsas,). On my regular rotation. Glad to see them nominated. Bien Trucha challenged my preconceptions about what lies in the great beyond of the far suburbs. In the city, this place would undoubtedly stand out as a star (a bigger-than-big star, wink wink) among all those "upscale" taco joints that seem to keep annoyingly multiplying - and at a fraction of their bloated prices. The cazuelita de camarones (perfectly cooked shrimp in chihuahua cheese, with garlic and cilantro-chimichurri - think shrimp queso fundido) alone did it for me. And their traditional margarita was spot-on. The guys and gals in the kitchen know what they are doing at Bien Trucha. I support this GNR nomination!